They were fought on April 19, 1775, in Middlesex County, Province of Massachusetts Bay, within the towns of Lexington, Concord, Lincoln, Menotomy (present-day Arlington), and Cambridge, near Boston. The battles marked the outbreak of open armed conflict between the Kingdom of Great Britain and its thirteen colonies in the mainland of British North America. 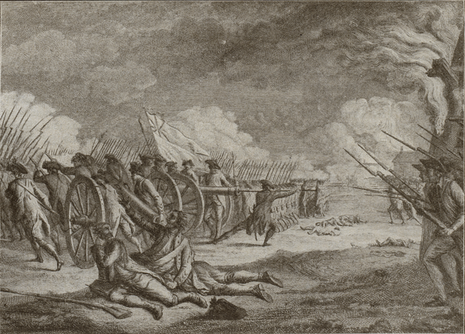 About 700 British Army regulars, under Lieutenant Colonel Francis Smith, were given secret orders to capture and destroy military supplies that were reportedly stored by the Massachusetts militia at Concord. Through effective intelligence gathering, Patriot colonials had received word weeks before the expedition that their supplies might be at risk, and had moved most of them to other locations. They also received details about British plans on the night before the battle, and were able to rapidly notify the area militias of the military movement. The first shots were fired just as the sun was rising at Lexington. The militia were outnumbered and fell back, and the regulars proceeded on to Concord, where they searched for the supplies. At the North Bridge in Concord, several hundred militiamen fought and defeated three companies of the King's troops. The outnumbered regulars fell back from the Minutemen after a pitched battle in open territory. More Minutemen arrived soon thereafter and inflicted heavy damage on the regulars as they marched back towards Boston. Upon returning to Lexington, Smith's expedition was rescued by reinforcements under Hugh, Earl Percy. A combined force of about 1,700 men marched back to Boston under heavy fire in a tactical withdrawal and eventually reached the safety of Charlestown. 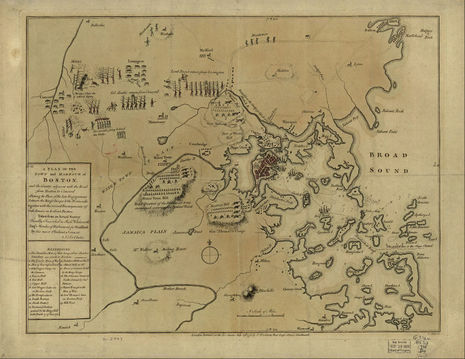 The accumulated militias blockaded the narrow land accesses to Charlestown and Boston, starting the Siege of Boston. 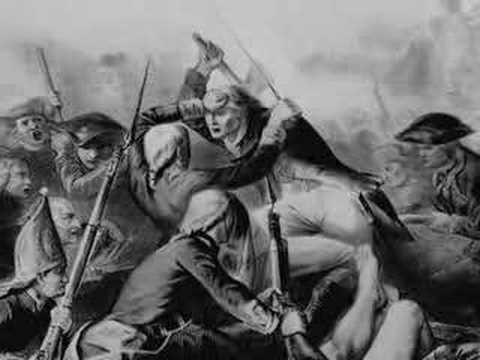 On April 19, 1775, British and American soldiers exchanged fire in the Massachusetts towns of Lexington and Concord. On the night of April 18, the royal governor of Massachusetts, General Thomas Gage, commanded by King George III to suppress the rebellious Americans, had ordered 700 British soldiers, under Lieutenant Colonel Francis Smith and Marine Major John Pitcairn, to seize the colonists' military stores in Concord, some 20 miles west of Boston. A system of signals and word-of-mouth communication set up by the colonists was effective in forewarning American volunteer militia men of the approach of the British troops. Henry Wadsworth Longfellow's poem "Paul Revere's Ride" tells how a lantern was displayed in the steeple of Christ Church on the night of April 18, 1775, as a signal to Paul Revere and others. At Lexington Green, the British were met by approximately seventy American Minute Men led by John Parker. At the North Bridge in Concord, the British were confronted again, this time by 300 to 400 armed colonists, and were forced to march back to Boston with the Americans firing on them all the way. By the end of the day, the colonists were singing "Yankee Doodle" and the American Revolution had begun. In the village of Lexington west of Boston, the residents had been preparing for a fight they thought was imminent. They had accumulated powder and shot during the winter, but the high cost of those items had made target practice a rarity. On the evening of April 18, 1775, many of Captain John Parker’s militiamen gathered in a local tavern to await word about the movement of British soldiers, an event that had been rumored for several days. The presence of John Hancock and Samuel Adams, the two men most wanted by royal authorities, made Lexington a logical choice for the redcoats' attention. Further, the neighboring town of Concord had recently hosted the illegal Provincial Congress and was thought to harbor a rich cache of arms. Confirmation of the British advance was delivered to Lexington by Paul Revere and William Dawes. 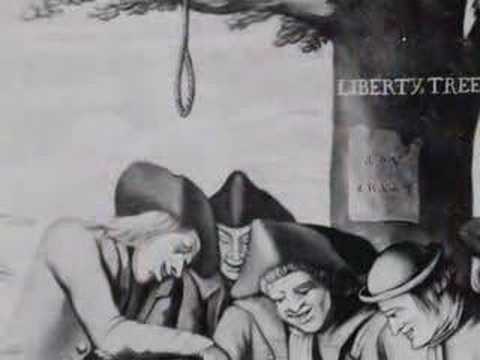 In the early hours of April 19 the Minutemen, so-called because of their pledge to be ready to fight "at a minute’s notice," began to gather on the village green. During the night the size of the force changed constantly as some men quietly departed for their homes and others appeared to lend their support. As the British advance party approached shortly after dawn, 77 Minutemen were instructed by Captain Parker: "Stand your ground; don't fire unless fired upon, but if they mean to have a war, let it begin here." The British commander, who was pleasantly surprised by the small size of the American force, ordered the colonists to throw down their arms and disperse. Some began to obey the order to leave, but held on to their arms. At that point a shot was fired — its source is unknown. Other shots quickly followed and when the smoke cleared, eight Americans lay dead and 10 were wounded; one British soldier was slightly wounded. The outmatched Minutemen retreated into the nearby woods and the redcoats proceeded westward to their main objective, Concord.